By default, Veeam Backup & Replication uses a ‘Sea Green’ color theme for the UI. If necessary, you can change the color theme. 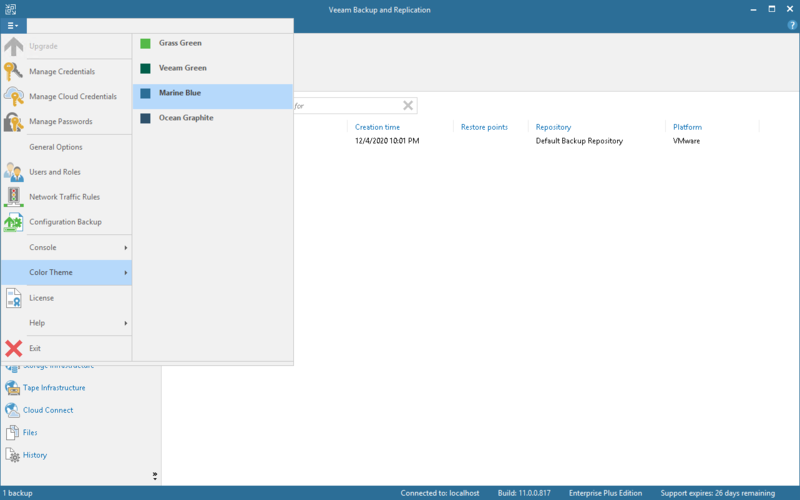 Changing the color theme can be helpful, for example, if you connect to different backup servers from one remote machine on which the Veeam Backup & Replication console is installed. In this case, you will be able to easily differentiate with which backup server you are currently working. From the main menu, select Color Theme. Choose one of color themes: Veeam Green, Sea Green, Marine Blue, Ocean Graphite. Color theme settings are applicable for a specific combination of a backup server and user account. For example, the color theme is initially set to the default one. You log on to the Veeam Backup & Replication console under some user account and change the color theme to Marine Blue. If you log on to the same backup server under the same account next time, the color theme will be set to Marine Blue. If you log on to the same backup server under another account, Veeam Backup & Replication will use the color theme that was previously set for this account — that is, the default color theme.